Here’s one I loved . 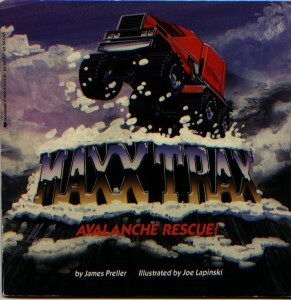 . .
My mom dug out some of my old books from when I was a kid, and I got my old copy of Maxx Trax: Avalanche Rescue back. 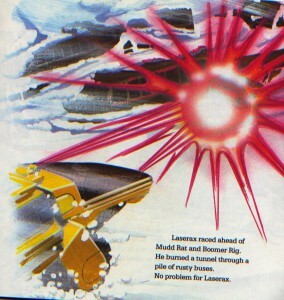 I remember loving this book when I was a kid, I was really into the artwork. I remember seeing another book in the Maxx Trax series at some point, but can’t remember what it was called. How many books were in this series? The art is really great, very eighties in its sensibility. 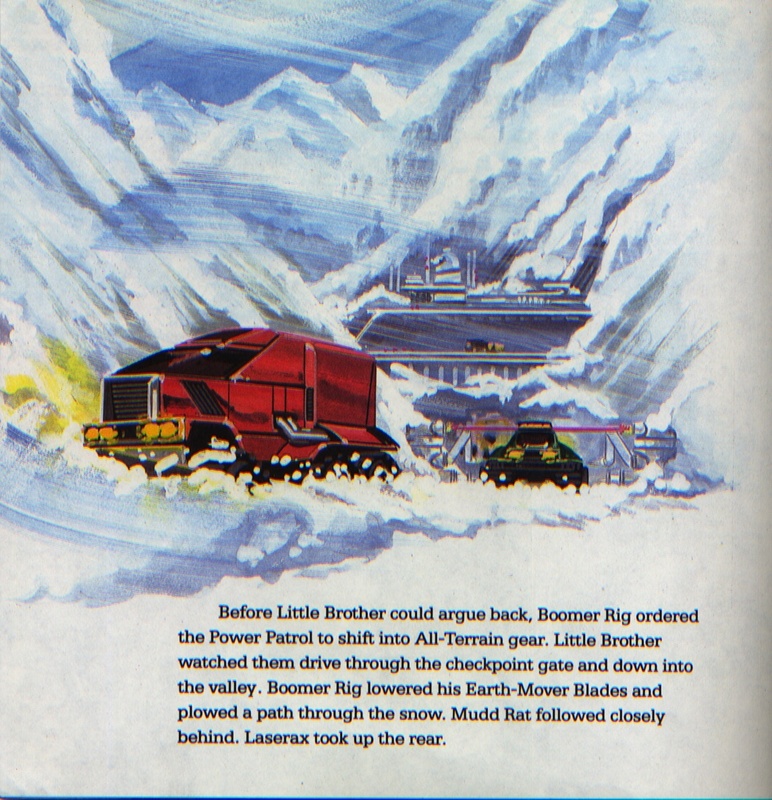 I was reading through the book and got the impression that the trucks were left behind after an armageddon, since there were no humans, and the trucks had to cross over a pile of abandoned cars, and the snow seemed to indicate a nuclear winter. 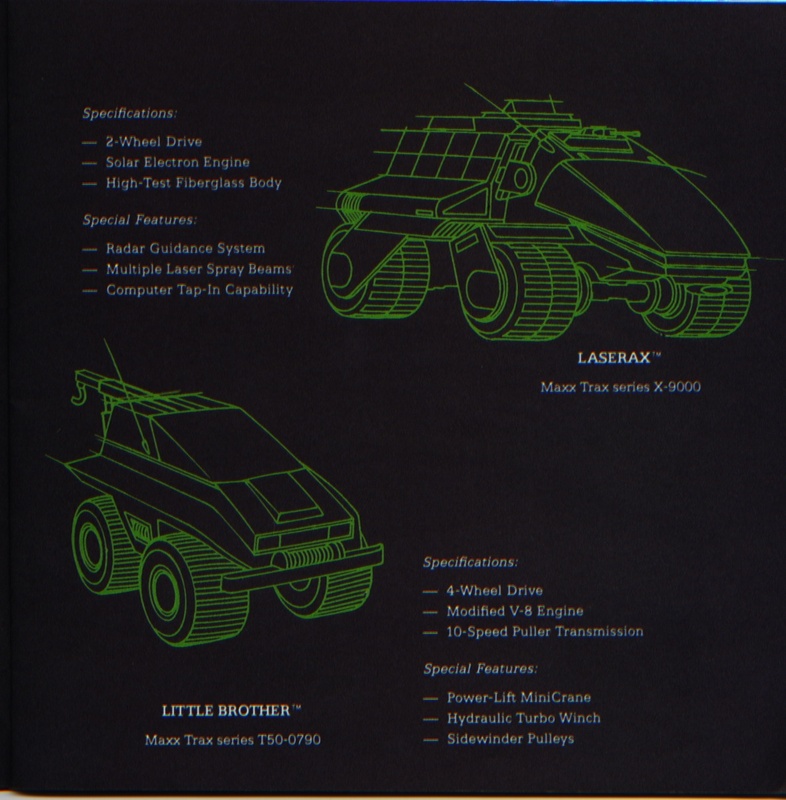 I was just curious about your take and inspirations for these books, I am an artist myself now, and appreciate the vehicle designs, and interested in the origins of one of my favorite books when I was a kid. Eli! Thanks so much for that letter. Maxx Trax: Avalanche Rescue was my first published book, back in 1986 when I was a mere pup, 25 years old — and that was the little book that launched this Incredible (Unstoppable! Unflappable!) Publishing Empire. Thank you, thank you very much (in Elvis voice). Actually, I have great fondness for that book. It’s been out-of-print for nearly two decades, but when it was first offered on Scholastic Book Clubs, they put it on the front cover of SeeSaw Book Club and it sold through the roof, eventually moving more than 1,000,000 copies. Crazy, I know. But because it was my first book, and worked in-house as a junior copywriter, I was paid a flat fee, no royalties, so I earned $2,500 on the deal. But I’m not bitter! The book began with a Star Wars-inspired introduction, epic and overblown. It’s a little embarrassing, but also, I think, the tone we were going for. 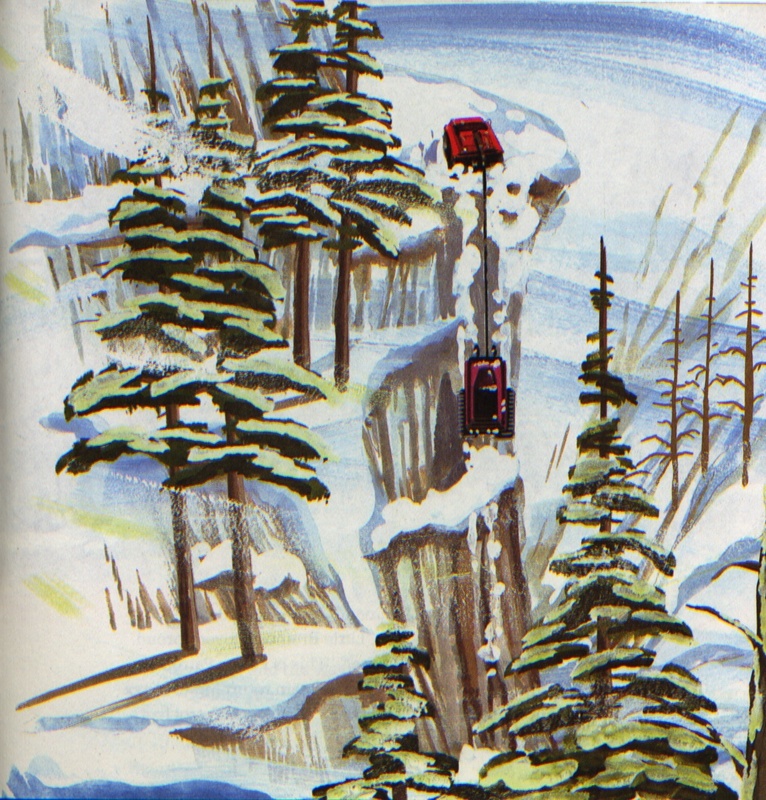 Even worse, when it came time for the sequel, Scholastic inexplicably fired the original illustrator, Joe Lapinski, who did such a pitch-perfect job on the original. He nailed it. But I suspect that Joe wanted more money for the next book, and corporate had other ideas. Yeah, sure, a nuclear winter makes sense to me. I’m not sure if I understood the backstory in those words, exactly. Perhaps I didn’t even think about it that deeply. I just kind of accepted the circumstances as fact and told the story from there — a world seemingly without people, with trucks that communicate and perform . . . all sorts of . . . amazing . 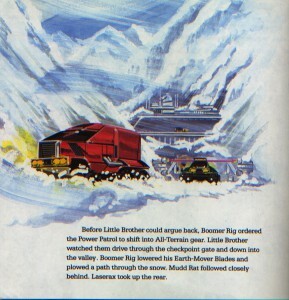 . . truck-ish type feats. With lasers! Here’s the killer. When I visit schools, which I do fairly often, I’ll sometimes pull that book out. Students always ask about my first book. And every time, the boys see it and freak out. They want to buy it right there, right now. And I have to say, “Sorry, I’ve got two copies to my name, that’s it. 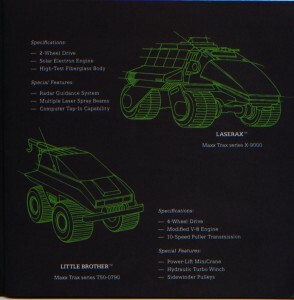 The book is out of print. You can’t buy it anymore.” If I’ve learned anything about the children’s book business in the past 25 years, it’s that I know Maxx Trax would sell today. It’s so cool, so much fun, so right for boy readers. Trucks and adventure. Quick, get Lapinski on the phone! Come on, Scholastic. Wake up, already. 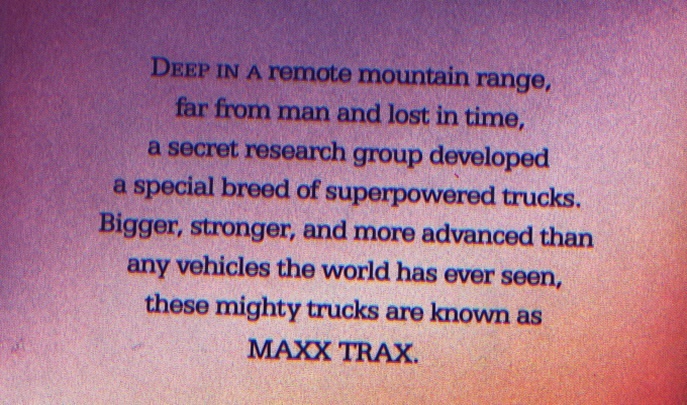 I’ve already got the title of the next — Maxx Trax: Tsunami Rescue! The Dawn of Maxx Trax must rise again . . . Seriously, Eli, thanks for writing. In every author’s heart there’s a special place for his first book. It was awfully kind of you to take the time to write to me. You’re a good soul. Good luck with your own artistic efforts — keep on believing in yourself, keep on feeding that brain of yours, and work hard. Send me a JPEG or something. I’d love to see what you’re up to.